Ride-sharing programs, primarily offered through Uber and Lyft, fall under the burgeoning new economic model known as the “shared economy” which is facilitated by GPS and user-friendly mobile phone application software. Ride-sharing as a transportation model continues to grow more and more popular. Consequently, there are increasing numbers of ride-share drivers who now need to consider the taxability of this income source. However, it is widely assumed that most ride-share income is self-employment income since the drivers largely maintain control over their driving schedule and for whom they drive. For example, a driver can potentially contract with multiple platforms (such as Uber and Lyft). In addition, these drivers use their own vehicle and pay their own expenses (such as gas, vehicle maintenance, and repairs). Income Reporting Your ride-share company may issue a 1099-K for customer payments. However, 1099-K issuance is only required on income exceeding $20,000 and 200 transactions. You might also receive a 1099-MISC for additional income such as referral fees and non-driving bonuses in excess of $600. Remember that you are responsible for reporting all of your income even if you do not receive a 1099-K or 1099-MISC that matches your actual income. You report all gross driving income and business expenses (deductions) on the 1040 Schedule C, the net of which determines the net income from this activity. Vehicle Deductions Your vehicle expenses will likely be the primary deduction you take if you are earning ride-share income. You can deduct vehicle expenses in one of two ways. Your first option is to deduct the actual expenses of your vehicle operation, including gas, tune-ups, repairs, insurance and vehicle depreciation. You should prepare a schedule, subtotaled by these categories, for all such expenses for the year (not just for the ride-sharing time). Keep in mind that you can only deduct the percentage of actual expenses and depreciation dedicated to ride-share driving time, so you will also need to report the percentage of total annual vehicle use allocable to ride-sharing. Your second option is to take the standard IRS mileage deduction at 53.5 cents for 2017 (increased to 54.5 cents per mile in 2018) for your business miles. We advise you keep up with your own mileage, which can include miles for driving between locations while offering ride share services. Research shows that many drivers underreport mileage because they rely on the mileage reports by Uber and Lyft, which only show mileage for when drivers are carrying a passenger. Also, remember that commuter miles are not deductible, which is defined as the travel from your home to your first work assignment, and at the end of the day, from your last work assignment back to home. For example, if you live 20 miles from the airport and you drive to the airport for your first passenger, that mileage is not deductible. 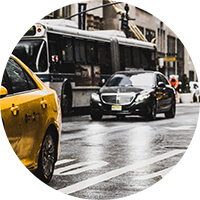 Additional Tax Deductions Other deductions to consider include the commissions paid to the ride-share company (Uber or Lyft) and any technology/software required for your vehicle for the drive. Keep in mind that the income reported by the ride-share business is inclusive of their commissions as well as tolls and other fees, reported separately from the 1099-K and/or 1099-MISC by Uber or Lyft on a Tax Summary document. Therefore, it is up to the driver to proactively make these deductions on the tax return. You can deduct the cost of mobile phones and the percentage of monthly service you attribute to business use. If you offer snacks, waters, or other gratuitous amenities to passengers, these are deductible. Your meals while working are not deductible unless they have a specific business purpose or you incur them while traveling out of town for a business-related purpose. Meals that qualify for business use are limited to 50% deductibility. Clothing is not deductible for ride-share drivers, even those who are offering high-level executive services and dress accordingly. Tax Considerations Self-employed persons, including independent contractors, are required to pay not only their federal and state taxes due but also both the employer and the employee portions of Social Security and Medicare taxes. There is no automatic mechanism to withhold these taxes, so drivers need to be proactive and put money aside for taxes. Depending on how much net self-employment income you are making, you may want to consider paying quarterly estimated taxes, and you could face underpayment penalties for failing to do so. Ride-share service income is still relatively new and therefore not well defined within the tax rules. But the IRS recently launched their “Sharing Economy Tax Center” which provides helpful information for deductions, tax considerations and third-party reporting for shared economy providers, such as Air BnB hosts and Uber drivers. There are also forums available to discuss ride-share driver issues and questions, including those of a tax nature, found through the Uber drivers subreddit on Reddit and Uberpeople.net. While valuable sources of information, we caution you that these forums may include inaccurate or misleading information and are not a substitute for professional tax advice from your CPA.